I fell in love with Claude Rains when as a schoolgirl my parents took me to see The Phantom of the Opera after which I never missed any of his films and have now seen most of them. I too loved Deception purely for his over-the-top portrayal of a sadistic maestro with delusions of grandeur. His first entrance in the film said it all, and I had to laugh when a film critic said that Davis’s humble home looked like Wembley Stadium after a jumble sale. I have the dvd and love to watch it still. I am still in love with Claude and never miss any of his films when they appear on TV. Having recently read his biography written by his daughter I appreciate even more what a genius he was, to rise from a Victorian guttersnipe with bad diction to such an accomplished actor. Truly the greatest actor ever never to be given an Oscar. I thoroughly enjoyed perusing your fine blog about one of my favourite actors – and especially, your remarks about DECEPTION. As Erich Wolfgang Korngold’s biographer (maybe you know my book ‘The Last Prodigy’?) I had the very great pleasure of interviewing Irving Rapper, Bette Davis and Paul Henried in the mid 1970s about this terrific film, as part of my research. One story that Mr Henreid told me was unfortunately cut from my book by the publisher, on account of the somewhat ripe language necessary to tell it accurately, but as it concerns Claude Rains, I will share it with you here. Henreid told me that Claude Rains never watched the rushes of his performances and didn’t even view the finished film. In fact he never watched himself on screen – he was such a perfectionist, he felt sure he would be unsatisfied with his performance. 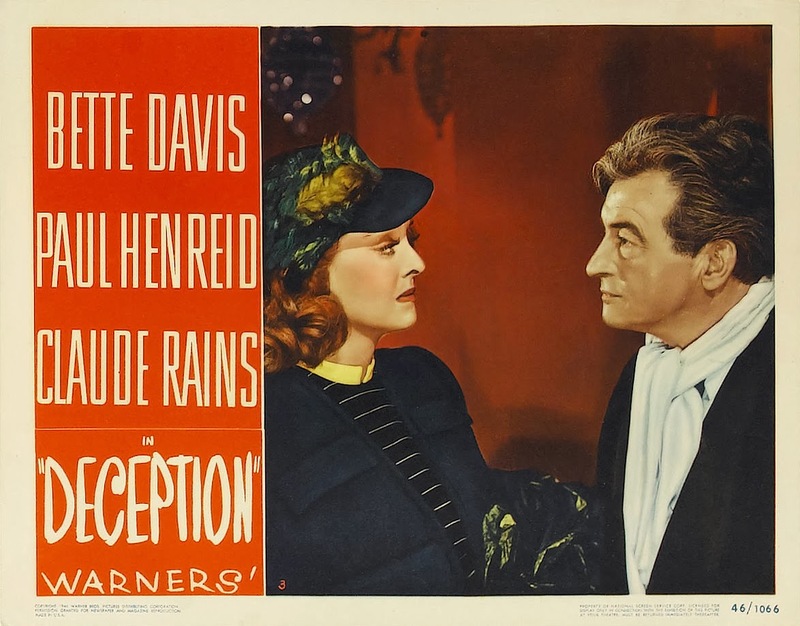 Well, DECEPTION was previewed at the Warner Theatre in LA and shortly afterwards, Bette Davis visited Rains at his home ( a farm in Pennsylvania where he always went after finishing any of his films – he hated Hollywood). Appparently, according to Henreid (who met Rains sometime later) Miss Davis (who adored Rains as we know) marched up to his front door, banged the hell out of it – he opened it with “Hullo Betty…” in that beautiful voice , as she swept past him, full mink draped around her shoulders, shouting…. …to Rains’ very great amusement. Then they both burst out laughing and he invited her to stay for dinner. Incidentally, Rains (who never had any musical training) was coached by Korngold in playing the piano and conducting for this film and did a very convincing job of giving the illusion that he could do both!